A Killer Whale performing a maneuver known as porpoising in Johnstone Strait off of Vancouver Island, British Columbia is a wonderful sight for anyone to see. The Northern Resident Killer Whales or Orcinus Orca, as they are known, will range from Campbell River all the way North to Alaska. There are many sight seeing excursions available for tourists and locals to view these magnificent mammals close up. 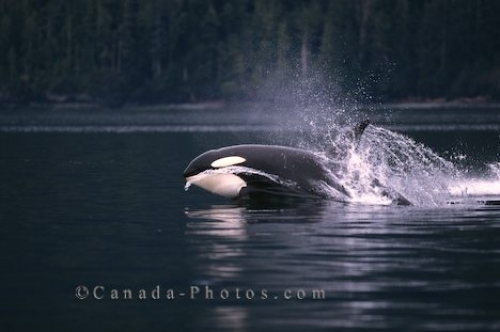 Killer Whale, porpoising Orca Whale, Johnstone Strait, Vancouver Island, British Columbia, Canada, North America.